During my last trip to Favigana, Sicily, I bought a book of Sicilian recipes named – Ricette di Osterie e Genti di Sicilia (Recipes of Taverns and People of Sicily) – Slow Food Publishing. As the title says, this book is a collection of recipes from different taverns and well known cooks across the fascinating Island of Sicily. One of my favorite recipes in this book is Timballo di Anelletti (Timbale of Ring shaped pasta) which is baked pasta with ground meat, a specialty of Palermo – Sicily’s capital city. 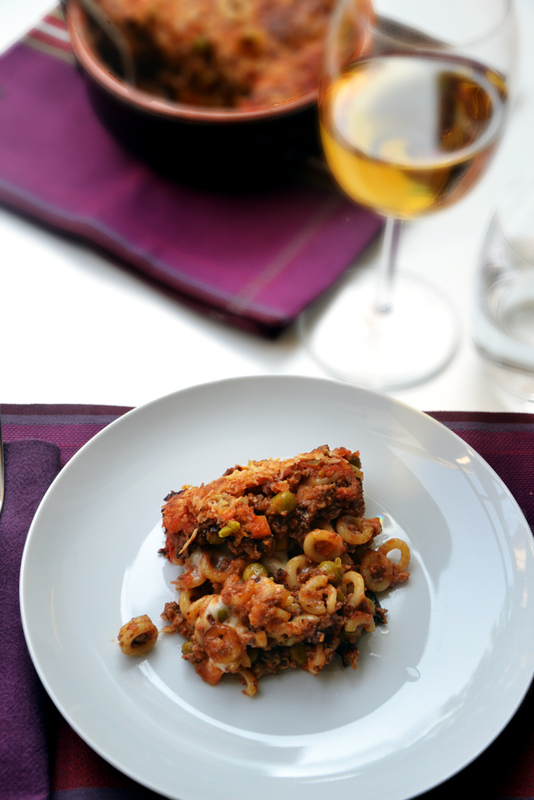 Timballo di Anelletti, prepared in Palermo for special occasions or festive days, is a dish that has Arabic origins and it has some similarities to Greek Moussaka. This recipe is my idea of comfort food because it has earthy fried eggplants, a ragù of mixed ground meats, gooey cheese – all baked into a concoction of pure goodness – so hearty and perfect for this time of year. The recipe I am about to present is the classic version but I made some variations: I added tomato sauce instead of tomato puree, added white wine and omitted ham. In a saucepan add extra virgin oil, add chopped onion until it becomes translucent. Add ground veal and pork and let it cook for a few minutes. Add white wine. Add tomato sauce, and add salt and pepper to taste. Cook over low heat for about 30 minutes. Stop cooking when the sauce has thickened. Meanwhile cook anelletti following package instructions. Drain and transfer them in a bowl. In the bowl containng anelletti pasta, add ragù, pecorino cheese, caciocavallo cheese cut into cubs, and minced parsley. 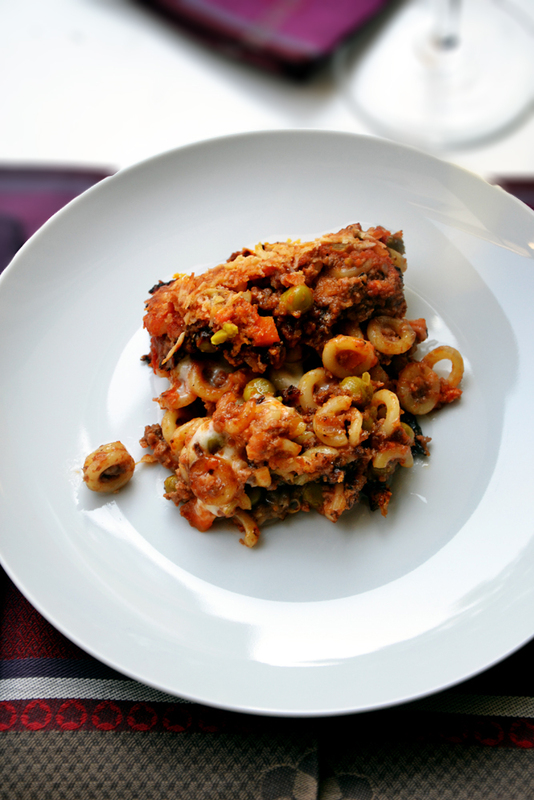 Pour the anelletti, ragù and cheese mixture into a baking pan, add eggplants slices. Continue doing layers of pasta mixture and slices eggplants until done. Sprinkle the pie surface with bread crumbs, and some grated Pecorino cheese. Bake at 180 °C (350 ° F) for 30-40 minutes. I don’t think I’ve ever eaten or seen that wonderful looking anelletti pasta. You are welcome! Anelletti is a regional (Sicilian) pasta format. I guess it is hard to find outside Italy. However, you can substitute it with macaroni. I used these plum colored napkins since I like the contrast wih the colors of this dish. I am glad you liked it! I’m so excited to see this for a number of reasons. (1. You’re deserving of awards and picked some great people to pass it onto.) 2) Timbale! I’ve only made one and am thinking about doing it again on Thanksgiving. We’re having our traditional meal early, so the makes me think of doing an Italian feast instead. I can’t wait to study this a bit harder and compare it to other recipes. Thanks so much! Thank you Greg!! You are so sweet and kind!!! Ha, me again. I know I can’t find that amazing pasta shape here, sadly. Hi Greg!! Oh..I know it is hard to find!! But don’t worry! You can do it with small tubular pasta!!! Macaroni should work perfect also!! I am sure you can find some pasta formats from Barilla brand or De Cecco!! Thanks for the nomination Ambrosiana. This recipe looks amazing! You deserve it!!! You have a wonderful blog and I really enjoy reading it! This is a great recipe, Ambrosiana, and just the type that I favor when the weather grows cold. I love how it will warm the kitchen and perfume the house. Thank you for sharing this little bit of Sicily with us. And thank you for your kind words about my blog. You got it!! 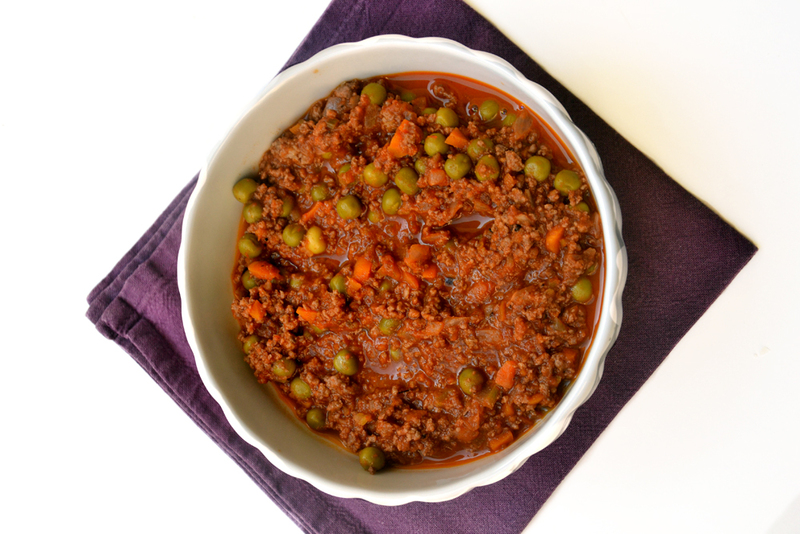 This is the kind of recipe that still has summer products (that are still available) and hearty ragù that is perfect for chilly weather!!! As regards to your blog, I think your blog is beautiful not only beacuse you have really good recipes, but because it is about your family’s traditions – something we should always treasure and be proud of it!! Thank you Stefanie! I think all flavors combined are fantastic!! I was lost in the beauty of your pictures and the recipe (I love anything with eggplants!) and was surprised to see my name up for an award! First of all congratulations on the award..you more than deserve it..
and thank you so so much for the award..you made my day..I am truely honored! Thnsk you very much!!! Your compliments are just flattering. And oh yes, your blog deserves all the possible credits!!! It is outstanding!!! How wonderful! I have just written a post which mentions Timballo – but I haven´t cooked it recently. My mum makes a wonderful version and she also uses breadcrumbs like you. It´s an amazing party dish and yours looks stunning. Congratulations on a great dish and your award!! Thank you chica!!! Timballo is such a comfort food, specially when mom cooks it for us!!! As always, your blog brings me lots of great recipes and smiles!! 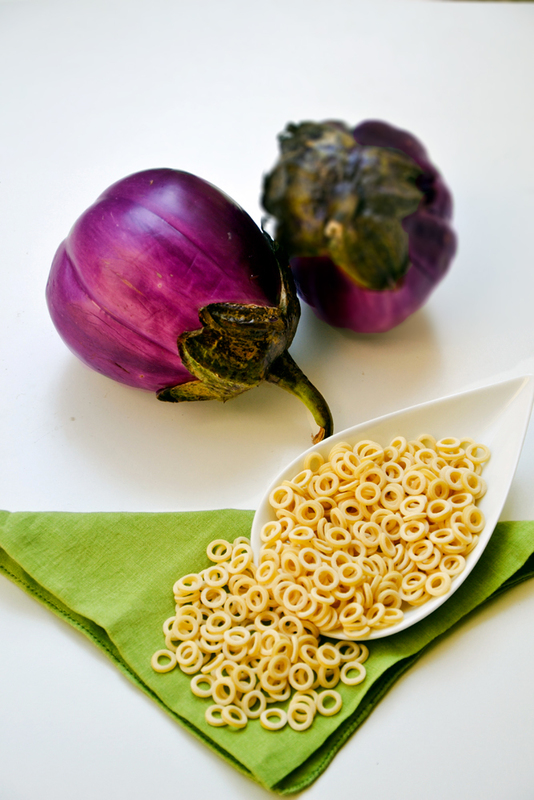 This is a wonderful dish,full of flavor and my favorite ingredient, eggplant! I love the pasta shape! I always buy pasta from Italy from my Italian market. I have no problem spending $5-6 dollars on my pasta and the shapes are all so much fun!! I bet that book has some amazing recipes! Yes that book has some amazing recipes..I haven’t had the opportunity to go through all the recipes I want to make (not enough time!). But when I make them, I will be sharing them with you!! Thank you!!!!!!! Double thanks!!! I am flattered!!! I am cheking out that link!!!! You are such a sweet person!!! Thank you!! And thanks for stopping by!!! Thank you RaeDi!!!! Yes awards – even if we are so shy to accept them – are very good PR!!! That book sounds quite interesting, I’ll try to get my hands on one. I love that it gets recipes from Tavernas etc….REAL cooking!